Rudra is the Reliever of Sufferings. Here, Shree Maa sings the Rudrashtadhyayi, the very famous eight chapters of the Shukla Yajur Veda, which is one of the oldest expression of spiritual wisdom known to mankind. These chapters are especially beloved to Lord Shiva and they include a ninth chapter at the end conveying peace to all existence. 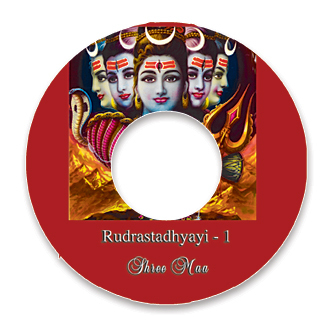 Shree Maa’s chanting of this scripture is extremeley powerful…this disc is highly recommended for all Shiva worshippers! The Rudrashadhyayi is an amazing scripture, and when Shree Maa chants it, my mind is completely dissolved into Lord Shiva! The rhythm and melody overwhelm my awareness and swiftly send me into a deep meditative mood. I LOVE to listen to this and follow along reading Swamiji’s translation. Thank you for this wonderful gift of devotion.